with the whole spectrum of the supernatural. Tales such as those of the supposedly haunted Erasmus Castle that were not long ago on everyone’s lips, and hauntings at Jan Smuts House Museum in?Irene which are now almost forgotten are recorded, and so are numerous lesser-known cases of unexplained phenomenon. The colourful stories include experiences with the supernatural in private houses, public institutions, at a school, a restaurant, hospitals, theatres, police stations and museums and involve individuals from all walks of life. Further, there are stories dealing with ghost catchers, spiritualists, exorcists and cults who either condemn ghosts as being of demonic origin or purposely contact the spirits of people who have passed on in order to communicate with them. Ghosts of Pretoria is not only a fascinating book everyone would like to read, but a valuable contribution to Pretoriana. 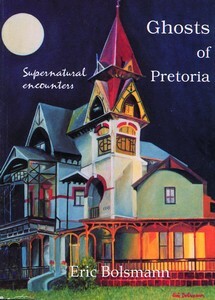 Ghosts of Pretoria was published by Be My Guest Publishers in?Pretoria as an illustrated 160-page soft-cover edition in 1997.